It is puppy mayhem here at my house. Utterly puppy craziness. If I am not at work I am spending all my time standing outside with one or two puppies waiting for them to potty or poop. It isn't just me, everyone in the family is doing the same thing. It is all about poop, potty, stop biting, get down and oh yeah, don't destroy my laundry room wall after you have been in there only 15 minutes. They are darling and I know puppies are inquisitive. If they see a wee bit of paper coming off the wall they are going to go for it. I actually didn't even know there was a bit of paper coming off the wall. This is not exactly what I had planned. I am not in love with the paper, it came with our house so must be 22 years old, but still! I think our Hank was the instigator in this laundry room wall mess but since there were no witnesses I can't really lay the blame on him. I think I need to rename my blog to, Mere- will never get to knit or crochet again. Or, Mere- is a complete nut job for taking on two puppies. Or how about, Mere-will never be able to read another blog in her life, or at least until her puppies stop destroying walls. Bear got his first bath with us last night. Can I say he was not impressed? He kept picking up his paws like he was stepping in something repulsive. Now mind you he doesn't mind stepping in his water bowl, I mean like all the time. He steps in it and trails water everywhere. He is just so darling. He cries and cries for me to pet him or pick him up. He sits by me at dinner time and wants to sleep with his head on my lap in the evenings when there is a rare bit of peace because they are both so exhausted. Bear follows me around and is always under my feet. He is so precious with those deep brown eyes. Hank is more active and always wants to play. He likes to bite but then always allows Bear to be on top when they are puppy wrestling. He loves a bit of cuddling but then goes off to lay down where he has room and isn't bothered. He is doing so well with sitting and we are working on, "stay." Bear is a few weeks behind as far as training. Hank has those gorgoeus curls on his head and beautiful green eyes, he seems to be a bit more independent than Bear. It really interesting to see the differences in their personalities. Siblings are like that, aren't they? I have been on the hunt for proper gates all week. I mean I have spent an exorbitant amount of time shopping for them or looking for them on line. I have one to block off Little Buddy's room, so he can see out but they can't see in. I have two with doors, one to block off the laundry room where their crate is and one to block off the main kitchen area from the garage door. And I am waiting for one to block off the kitchen from the rest off the house. It looks like we are in prison here. One smallish gate I had purchased to block off the garage door area was installed and Bear promptly climbed over it. I mean 10 seconds after I was done. He must be part mountain goat. Okay, I have been on this computer long enough. The boys are getting restless even though you would think they would be exhausted after the laundry room incident. We have guests coming for the weekend, I know more fun to add to the already crazy party. See you when I can. Two puppies are definitely going to make for a crazy household. But there i also non-stop cuteness! Good luck finding the perfect gates. I can understand how crucial they are for you right now. Puppies are so much work-but so worth it. They also grow up fast-too fast. I can't believe Pup will be 4. They are adorable Meredith and will be worth all the hard work in the end. I had forgotten how much work they are, but what fun. I am smiling ear to ear but I know it's exhausting! Like having twin babies! At least they are really really cute! Hang in there dog mama! Oh my! It is all go at your house then!!! Hope that you get a few minutes to enjoy your guests and that the doggies will soon be moving towards a slightly calmer phase - she says with hope although she knows it isn't realistic!! I am sure that they will be great friends with each other and with you all, it just takes time doesn't it. Thank you for popping by mine. I don't know whether to laugh or cry with you, it will all come good in the end. At least they are not Springer Spaniels, I was once daft enough to have three together and a mad Westie puppy.. They kind of DO look like they are in prison in that first photo. But they are so CUTE you can't hardly get mad at them. Such fuzzy soft looking pups --- they are going to be quite handsome when they are grown. Two puppies !!!!! I remember those days - including the zipper chewed and ruined on the new boy scout camping happening that weekend sleeping bag. That memory just jumped into my mind. Meridith please keep writing whenever they puppies give you a moment. Buddy must be in heaver with two puppies. Oh dear but they are gorgeous.When our daughter first had her puppy he ate Emily's home work.It sounded like an excuse to the teacher but it was true and there was photographic evidence!! the teacher made her re do it! Despite all of that...I'm jealous. Im truly jealous. Two pups is so fun!! You'll knit again I promise. I went into Petsmart to get the neighbors dogs toys (They invited us for dinner sunday and they don't need food or wine....) SO I went in during puppy class. Eavesdropping was my delight. This does not in any way quell my itch to get two female kittens. What is it about animals ?? ?/ I LOVE THEM ALL. Keep the photos coming. You dont really have to write anything! Oh my goodness! Double trouble.! They are so cute but puppies are SO much work. I had forgotten how much until I read your post. We rescued Chloe when she was two years old and was already beautifully trained. Try to get some rest this weekend Meredith and soak up all of that puppy love. Ruh-roh! Bad dogs! I didn't get my second dog until dog #1 was (mostly) trained. I also don't get dogs less than 6 mos. old - thanks for the reminder why! It is a good thing those two are so cute and lovable, isn't it? Crates and gates are god-sends! Oh the puppy life! Don't you just love the moments when they are FINALLY tuckered out and sleeping so peacefully??? Aw they are so adorable and look very busy! They will definitely keep busy and on your toes. It is so nice they can be together and play with one another. I hope that you have a good weekend and also find some time for yourself to knit or crochet! I love the picture story open and your post had me laughing happy puppy laughs. I'm so glad you all found each other and you're letting us live vicariously through you. I love this kind of puppy love it's the best. A huge commitment. But I think you did the right thing. They look so happy together. My big regret with having 2 cats was that they didn't get on with each other. They weren't siblings, so maybe that was the problem. Your breeder friend knew how to pull on the heart strings! I laughed all the way through this wonderful post! what little darlings you have. but DANG! that wallpaper and vintage at that... it just tastes so good! except... if they ever manage to get the switch plate off and chewed on a wire! YIKES! I just showed Carolyn your series of photos. She was saying how cute they were and when she saw the wallpaper one she said, "What's that? ...Ohhhhh that's what they did!!!" and she burst into a big laugh. Your puppy brothers are so cute even though they are mischievous and need alot of attention, just like 2 legged children do. Goodness...but what memories they will make and Buddy will be enjoying them for many years. Hope you got all the gates figured out and how to open them or walk/jump over them! Happy weekend, my friend! Ha-ha! Oh my! Sorry, but you had me giggling throughout this entire post. You definitely have your hands full. They are ridiculous and cute - what can you expect from puppies? But yes, I'm sure they are also a handful. at least your life is never boring! Hope you had a great weekend, Mere, without too much canine excitement! 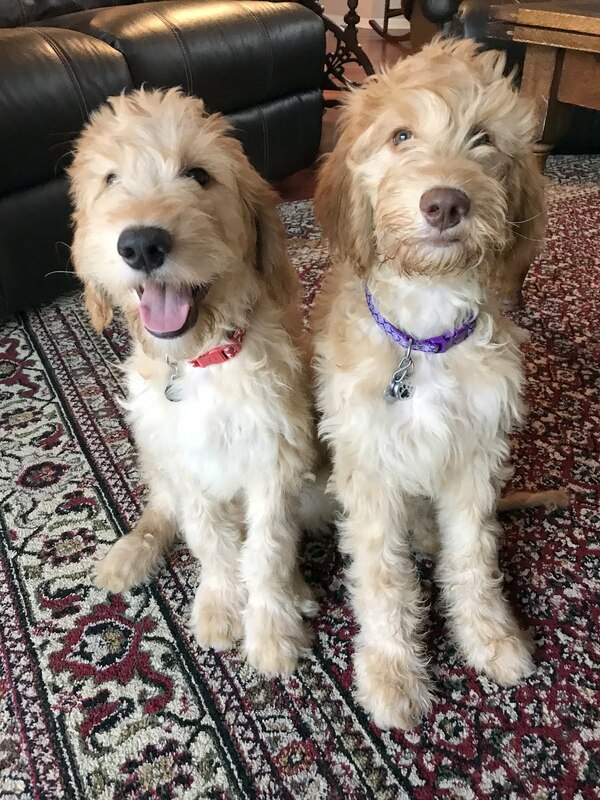 Keep the photos coming; they are adorable despite being mischievous. Oh Mere, they are adorable! The order of photos is so funny - in the one right after the wallpaper they seem to be saying "Who, us? Destroy wallpaper?" Sending you a hug and best wishes for the energy you need to keep up with these new furry family members. I can't even imagine the craziness! Did you by chance read Jen's (A Cottage Nest) blog post? She has a new Golden Retriever puppy too and is going a bit nuts. ;-) I can't imagine having two! Hang in there and try to enjoy the puppy cuteness and snuggles. Oh dear. There's a lot more work, but you find a (little) moment to write this blog.